For Aanchal Malhotra, the stories of Partition were stories that needed to be told. It resulted in a book, reports Payal Mohanka, punctuated with endearing moments, uncontrollable tears, a poignant tribute to ordinary people with extraordinary lives. IMAGE: Maang-tikka brought from D I Khan, North West Frontier Province to Delhi. 'I found myself wishing that I had met her, that I had known her for myself. But somehow, because I had worn the necklace too, it made me feel as though I was a part of someone I had never known,' is how Aanchal captions this picture. She may have crossed many more borders than she intended. Piercing the shroud of silence that buried angst-ridden memories of Partition, the most painful event in the history of the subcontinent, 28-year-old Aanchal Malhotra spent four years researching objects that crossed the borders with their owners as they left the land of their birth in search of a new home. Her book Remnants Of A Separation: A History Of The Partition Through Material Memory salutes the resilient spirit that overcame immeasurable suffering on both sides of the border. On the sidelines of the Kolkata Literary Meet 2018, I caught up with Aanchal who was among the very young authors participating in the annual festival. Partition is a subject close to her heart. Aanchal's grandparents had crossed the border from Pakistan and come to India as refugees. Her paternal grandfather, Balraj Bahri Malhotra, initially sold fountain pens for a shop-keeper in old Delhi's Chandni Chowk area. One day, he heard of a refugee market where land was being given to refugees. His mother sold a gold bangle to help him buy the land. Today, the reputed bookstore in Khan Market, Bahrisons, is 65 years old and has expanded over the years, encompassing three shops. "He was a Maths student. Books were really not on his agenda, but he rose to the occasion. As a child, I did not know the story behind the bookstore. All that mattered was that there was always an abundance of reading material," says Aanchal, for whom reading became a passion. As a teenager, she saw her father Anuj Bahri write a book for her grandfather's 75th birthday gift, Chronicle Of A Bookshop. Her mother Rajni encouraged her passion for art and Aanchal did her bachelor's and master's in fine arts from Canada. 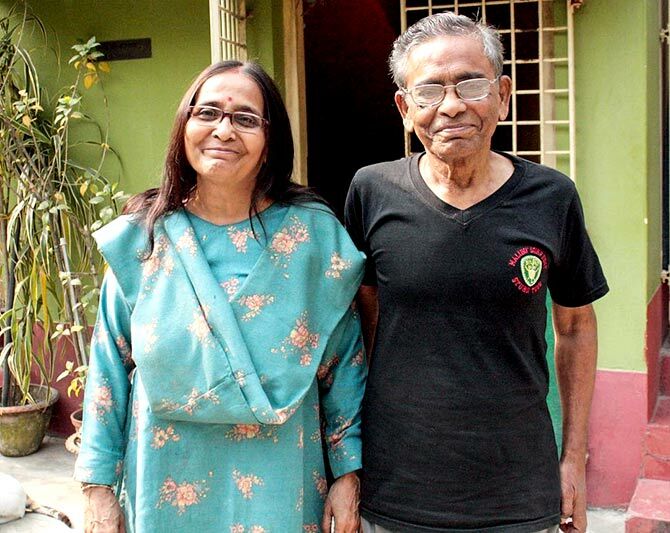 'Still smiling, she softly said, 'He used to tell me things -- many, many things -- about his life before they migrated to Calcutta city from Mymensingh zila. Repeatedly he would narrate the same incidents and I would never tire of listening to them. What their house looked like, what they used to eat, what happened there in 1947 and how and why they fled. Many years ago, I even wrote a poem based on his memories. But what I am trying to tell you is that whatever he remembered then is forgotten now. So what choice do I have, but to remember for him? How else will memory be passed down, how else will our children know of it? You see, the details of years have blurred into each other, making his mind cloudy. Slowly she placed her palm over his and smiled broadly. But I remember. I remember for him,' is how Aanchal captions this picture. An artist and oral historian, the interviews and research which eventually took the shape of this book, was originally her thesis. A hugely fulfilling journey, the hardest part for Aanchal was to keep a straight face through the interviews, not break down "and continue asking the questions, no matter how many times. And no matter what the reaction is from the person. I think the worst is when you know you are causing pain. There were times people said, 'Ab bass, beta', enough." But for Aanchal, these stories needed to be told; they needed to be chronicled. Punctuated with utterly charming stories, endearing moments, uncontrollable tears, the book is a poignant tribute to ordinary people with extraordinary lives. There were people who found it cathartic to share and there were those who did not want to re-ignite deeply buried wounds. Particularly touching is the chapter on Sunil Chandra Sanyal, who moved from East to West Bengal. Due to medical reasons, he has lost his memory. As his wife narrated his experiences, she said, "Sometimes, I think it is a good thing he no longer remembers. Forgetting is as important as remembering." IMAGE: Partition is a subject close to Aanchal's heart. Her grandparents had crossed the border from Pakistan and come to India as refugees. Aanchal remained objective during the interviews. It was when she sat down and heard them later that she was overwhelmed. "How could we have done this to one another? I can't believe people did this to each other. And no one talked about it." "I keep thinking about how it would have been if there were psychologists working with people who had gone through Partition, just to make men and women talk." "Partition wouldn't have been a conversation in hushed private quarters; it would have been active memorialisation. It wouldn't have been a secret; it would have been a strength." 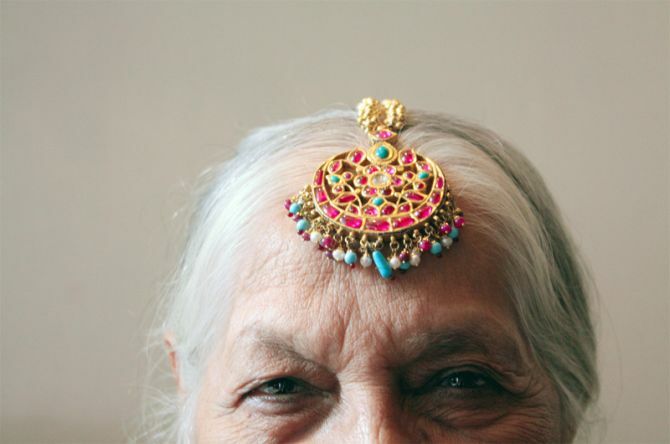 It was in 2013, when Aanchal saw two objects that had been brought from Lahore in her maternal grandfather's home in Delhi, that she realised how they seemed to transport the owner to his childhood in Lahore in an undivided India. It brought back memories of how his mother used these objects: The ghara, a vessel used to churn lassi and a gaz, a yardstick to measure fabric. "It struck me that we put memory, ambience, landscape and sensation into the objects that belong to us. We put parts of ourselves into these things," she says. The green shutters, her eyes are closed, there is a smile on her lips, "I still remember those green shutters." When she opens her eyes, they are moist with the recollection of a place never to be seen again. She tells me that her father took years building the house in Dalhousie, pouring in his love and passion. "Bade shauk se banaya tha, he built it with such fondness. And now imagine, woh border ke uss paar, it is on that side of the border, and we are on this side, humm iss paar." Though her smile is now sad, it seems deep enough to hold the memories of summers spent in the house with green shutters. Her new found passion to delve into the past surprised her family but gradually became a collective activity. Aanchal's incessant questions found answers. Her family began to source objects for her and gradually by, word of mouth, she was able to locate those who had crossed the borders with objects that would tell their story. Mundane, everyday objects narrated diverse stories of sacrifice and courage. For Aanchal it was an incredible discovery when her research affected real life. Two months after her book was published, a Sikh gentleman walked into her family's bookstore in Khan Market and asked for the author of the book. Her mother was a little worried as she gently asked if she could help him. He happened to be the present owner of the house in Dalhousie which had been covered in Chapter 17 of Aanchal's book. His family had received this as their settlement after Partition. In her book, Aanchal had talked of Lahore-based Sitara Faiyaz Ali's inability to forget her father's dream house with green shutters in Dalhousie, which he had built with love and passion. She hadn't seen it since 1947. Its photograph was amongst her most precious possessions. "Sometimes, when I close my eyes, I can still see the house. Even 70 years later, in my memory that house is still home," she had told Aanchal. The appearance of the Sikh gentleman in the bookstore was incredible. 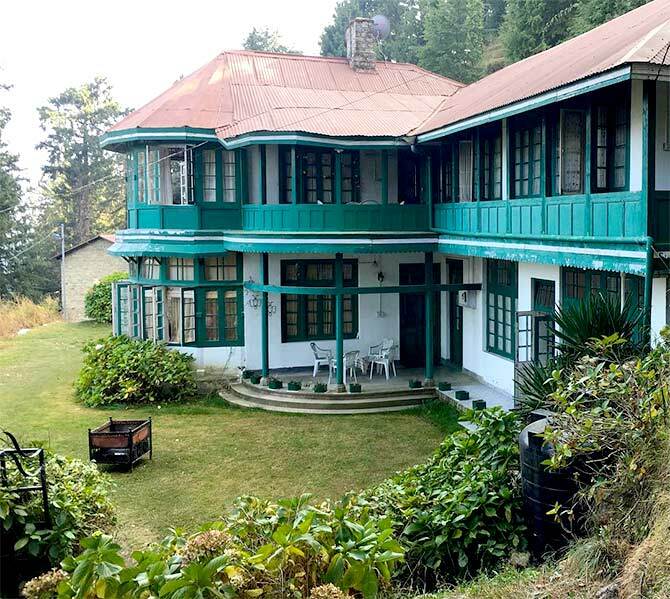 Aaanchal virtually invited herself to Kehkashan, the cottage in Dalhousie, skyped Sitara Faiyaz Ali and witnessed a moving emotional scene. The current occupants even brought out the original white ceramic nameplate which bore the name of Sitara Faiyaz Ali'S father, Mian Afzal Husain. "I asked myself why I was taking on a history that was not mine. It came so naturally to me and I realised it was the history of all of us in the subcontinent." "We have these shared sentiments that connect us to each other. And if you have the ability to make those connections, you should do it." This May, Aanchal hopes to get 93-year-old Sitara Faiyaz Ali across to India to visit what was once her home before Partition. 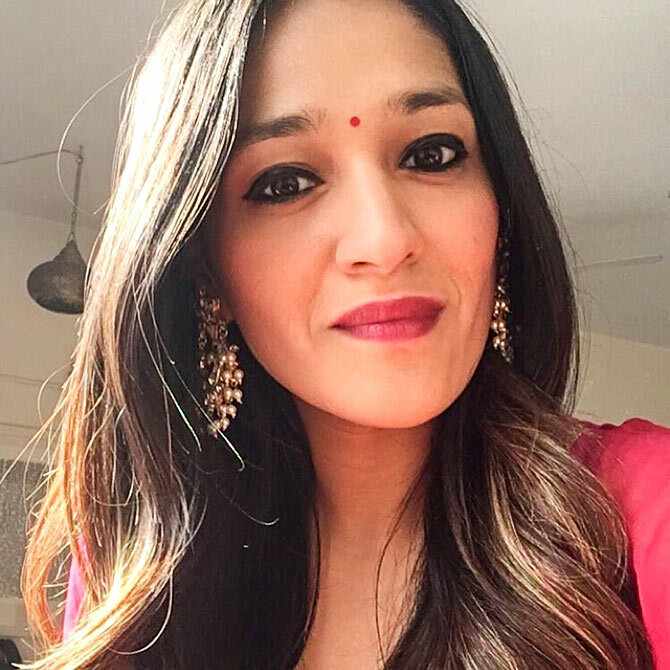 Aanchal has already begun work on her next venture, a novel about Indian soldiers on the Western front during World War I. And, as the co-founder of the Museum of Material Memory, a digital repository of material culture from the Indian subcontinent, her quest continues... tracing families and objects that crossed the border during the most traumatic event in the history of the subcontinent, hoping to unite hearts divided by a brutal act of history.